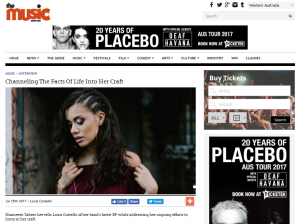 Nice write up from an interview that I did with premier Aussie music blog, The Music, where I talk about the background to my new EP. Shameem Taheri-Lee tells Louis Costello of her band’s latest EP while addressing her ongoing efforts to hone in her craft. Like anyone venturing closer to their 30s and further away from the acceptable age to make poor decisions under the guise of being ‘young and naive’, Shameem Taheri-Lee has felt the downward pull of adulthood. However unlike most of us, Taheri-Lee was able to channel that feeling and transform it into her band’s latest release, Time Does Not Reverse. Taheri-Lee’s vocals prove to be a lingering concern for the songstress, one that trickles into her live show. “I’m very self-conscious about my vocal and wanting it to sound tight, but sometimes there’s just that extra bit of emotion dripping off an imperfect note,” she reasons.